Cancun was the ultimate spring break, go wild destination. As resorts were placed along the Riviera Maya, south of Cancun, the breadth of attractions including golf has made for one potent vacation cocktail, especially as the temperature drops up north. Golf does not get the media notoriety in the RM because of the water activities and cultural jaunts like exploring Mayan sites. However, this is great golf with eco-diversity and incredible conditions with a bevy of hotel/resort options from moderate to Uber-grand. The Riviera Maya is the place where the “all inclusive” was popularized. One fee – your room, food, drinks and basic activities. This concept has dented some traditional vacation spots like Hawaii because competing with the one tariff for your stay is more than attractive. This area stretches along the coast for over 80 miles, so it is crucial to pick a hotel/resort that is close to the primary golf course you want as home base. During a week long trip, the best itinerary is to play your home base course three times and two others once, as that provides the perfect blend of golf diversity combined with relaxation with pool/beach lounging. All the resorts that stretch down the coast are good; it just depends upon your level of creature comfort, proximity to preferred golf and culinary tastes. The Moon Palace was one of the originals south of Cancun proper, and boasts a massive complex with almost endless pools, restaurants, beaches and kids activities. In addition, it has it’s own Nicklaus designed golf course with 27 holes. And of course, all your drinks and snacks are included as all-inclusive. So, if you want to entertain the little ones and golf without leaving the property, this is a great option. Be prepared, the Moon Palace is so big they run shuttles from one end to the other. 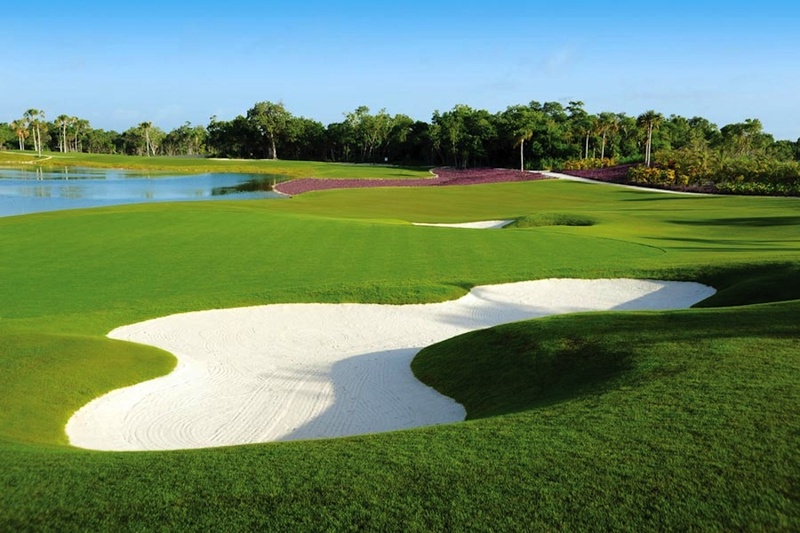 A relatively new course, the Grand Coral is a Nick Price design with twists and turns from bunker placement to water features that make this course big fun so you can play it every day. One feature of this course is you can bring your home course pro as part of the group and he/she can teach clinics, lessons and golf along with the group. If you play here, get the inclusive cart service and you will have a drink or snack every three holes. 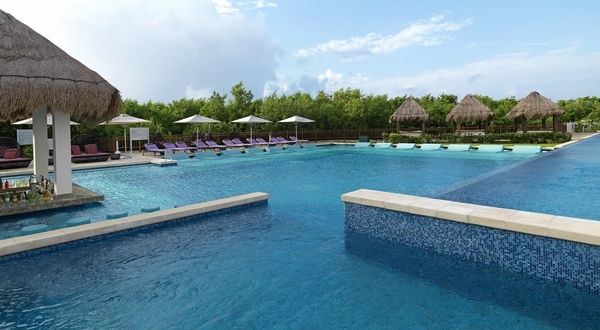 This course is close to the Playa Del Carmen shopping area, so if that is on the agenda, this course and one of the two hotels makes for a good springboard for shopping jaunts within five minutes distance. Close to the GC, you have two distinct resort options. The Sandos Caracol Eco Resort stresses sustainability. What really sets this apart is the minimal cut away to the foliage and jungle and the Mayan cultural shows, including their over-the-top Day of The Dead extravaganza. Each building has a sense of jungle cocoon, restaurants have local Mexican cuisine options, extensive animals on property and a great kids club and pool area. The Paradisus Playa del Carmen LaPerla is pure spa as soon as you walk in the entrance, with an emphasis on relaxation and service. You can easily go from pool to dining to beach to bar to dining and have quite a day of it. If you golf, and she does not, there are more than enough relaxation and YHI spa options to bring out the ooh-aahh factor. The restaurants and bars are exceptional and include South American, Gourmet Mexican and Asian. Another all-inclusive option which contains it’s own golf course is the Iberostar Grand Paraiso which is actually five hotels in the same complex. The complex is consistently rated as excellent for both romantic and family get-aways, not an easy accomplishment when all the properties are jockeying for accolades. A Spanish feel in the architecture with an incredible pool that runs almost up to the ocean, and much better than average culinary options. The Dye-designed golf course hosted the Big Break, and has enough challenge and use of natural hills and features it makes for a good home base course. 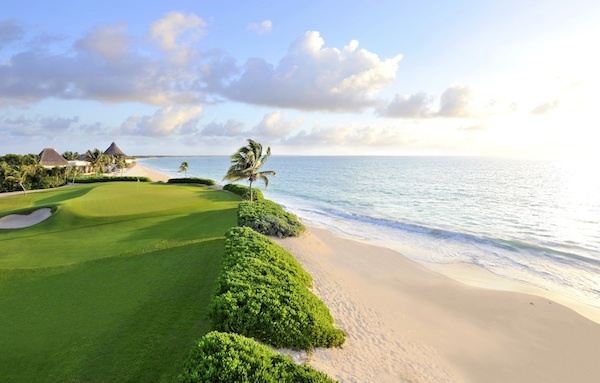 The recent attention getter in the RM is the El Camaleón at Mayakoba, home to the only PGA Tour event in Latin America, the OHL Classic at Mayakoba. One of Greg Norman’s best designs, it is golf adventure as you go through jungle, mangroves and swirling stretches of Caribbean sand. Incredibly manicured with a top-notch staff. Here a different lodging option is the Banyan Tree, which is pure privacy, and great for couples. Each room or villa option is it’s own world of luxury and retreat. Dining is just as unique as with gourmet dining on a private boat in the lagoon. If you want to be and just re-charge, this may be the ticket. Shuttle services like USA Transfers are best for airport connections, and transport to the various courses. Taxis in Playa Del Carmen are quick and for shopping excursions but too small for both golfers and their clubs. A trip that includes golf is off the brochure list for most travel agents in the Riviera Maya. Find a travel agent acquainted with these itinerary stops and the nuances of how best to put this together.